I always smell these type of products first. And I must say, the lemon zest had got to me. I’m not too fond of lemon personally but I didn’t let the smell overcome the product itself. The scent doesn’t last all day which is perfect for me. As instructed, a pea size amount is enough for your hands. The cream may look thick in the swatch above but it isn’t. It’s actually a light texture, spreads easily and is absorbed into the skin quickly. This has left my skin so soft and silky. I had even told my mum to feel my hands! Weird but soft skin. Lasts all day for me. Will need to apply it again once during the day after initial application depending on how cold and dry the weather is. On a good day, I won’t need to. Doesn’t leave my hands sticky but sometimes it does leave my hands feeling greasy if I used a bit too much. I did feel that this does the same thing as my other hand creams. Doesn’t seem like a special one. My hands doesn’t get very dry so I can’t really comment on the word “intensity”. 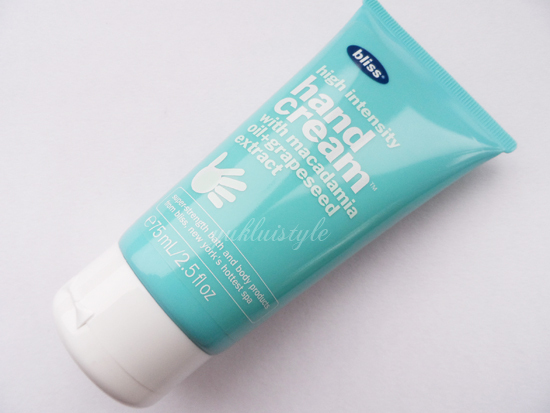 I can get the same results with cheaper hand cream as this is pretty expensive in my opinion.